He’s finally done it, folks. Tom Brady has completed his transformation into a Bond villain. After the Philly Special Super Bowl loss, he’s now entered the vengeful sequel faze. Last night he unraveled the evil villain look at the Met Gala (but forgot his crucial accent piece, a cat). There’s at least one silver lining for football fans — he looks quite comfortable in a role off the field, almost as though he’s prepared to retire at any moment. That’d be a real shame. A real shame. Not long after a rash of in-state football stars committed to play outside of the state, Eli Cox stopped the bleeding. 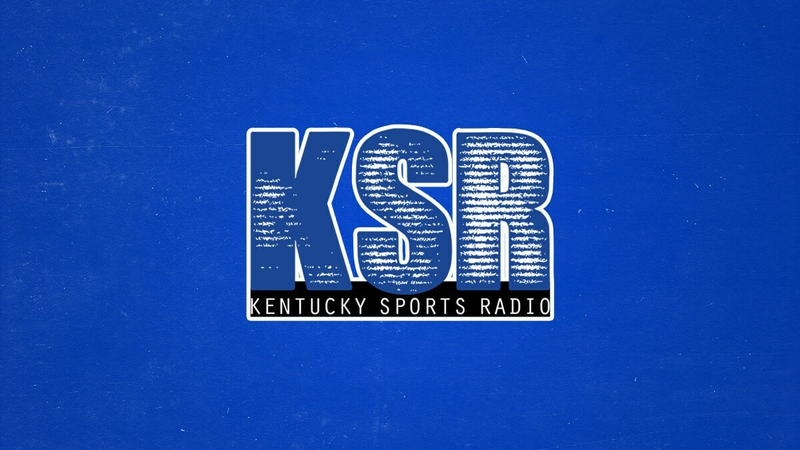 A 6’4″ 300 pound offensive lineman from Nicholasville, he committed to UK less than a week after receiving a scholarship offer. Watch the fourth commit in the 2019 class do work. Just before Cox committed to Kentucky, the state’s top uncommitted football player, Milton Wright, told 247 Sports that Kentucky is one of his top five schools. The Cats have to play catch-up with Purdue, Ohio State and Alabama, but I’ve learned to never count out Vince Marrow. If there’s just a slim chance, that’s all Marrow needs. Wright would be quite the catch for the Cats. Because the coverage must have been terrible. Not from our local stations of course, but from the network. NBC touted its lengthy coverage and excellent ratings, but Awful Announcing does not believe quantity is better than quality. After fighting to win in seven in the first round, the Cleveland Cavaliers LeBron James swept the Raptors with a 128-93 game four win. LeBron does everything on a basketball court. Ian Eagle lost his mind with the “LeBrontosaurus” behind-the-back assist. What kind of crazy witchcraft is this? LeBron’s Cavs will likely play the Celtics in round two, but they’ll get to wait a few days thanks to Philadelphia. The Sixers beat Boston 103-92 in game four, but The Process will not be alive much longer. We’re not a big hockey blog, but a couple of crazy things happened last night. The Washington Capitals have lost to the Pittsburgh Penguins in the playoffs essentially every year since the sport was invented. Last night, they finally got over the hump. This overtime goal is sending the Caps to the Eastern Conference Finals for the first time since 1998. In related news, few people are happier than Mrs. Tyler Thompson. The Preds took down Winnipeg to force a decisive game seven in Nashville this Thursday and I am not sure the town will be able to handle the chaos. Today is a great day to say Thank You to the teachers in your life. Teachers, if your students don’t do it, these Lexington and Louisville area business will. Sulking Pens fan here. Congrats to the Caps. The Penguins just ran out of gas after two straight runs to the Cup. Gonna pull for Nashville now, though I don’t see anyone beating the Lightning with how hot they are right now. Tom Brady was in that picture?? Sorry Mrs. T, but I have to pull for my wife’s Jets. If the Predators win though, then go Preds!